*This is not a stock item. It is only available upon request upon which time it will be manufactured. Usually takes up to 90 days before shipping. Specify set up for embroidery only or zigzag with feed. It will do both. The machine is capable of embroidering names and marks on sewing products, as well as zigzag stitching, by simply changing the throat plate and setting zero stitch length. When using this machine for zigzag stitching, the zigzag width and stitch length can be changed so that many different types of zigzag stitch can be sewn. The JUKI LZ-391N can be used in three different ways. When this machine is used as embroidering machine, the zigzag width as large as 12mm and the sewing speed is as high as 1,700 s.p.m. When used as a zigzag stitch machine, the zigzag width is as large as 10mm and the sewing speed is as high as 2,000 s.p.m. 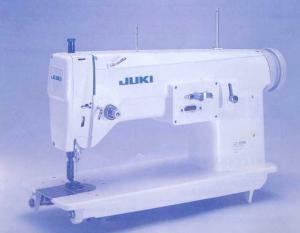 Furthermore, the JUKI LZ-391N can be used as a straight stitching machine capable of running at a speed of 2,000 s.p.m. by simply setting the zigzag width to 0. It can be easily converted to an embroidering machine by removing the feed dogs, which make a zigzag stitch machine or a straight stitching machine. To change from embroidering to zigzag stitching or vice-versa, all you need to do is install the throat plates included and exclusive for either function, and install/remove the needle plate and feed dog. This procedure can be carried out very easily. The zigzag width is adjusted by raising/lowering the knee lifter using the knee. The stitch length is adjusted by moving the feed adjustment knob up/down by hand. This adjustment mechanism allows even the inexperienced operator to carry out adjustments without any difficulty and quickly,thereby enabling this machine to be used very easily. the zigzag width fixed to a certain value, the pointer should be fixed to that value. attachments for an ordinary zigzag embroidering machine can be used with this machine.